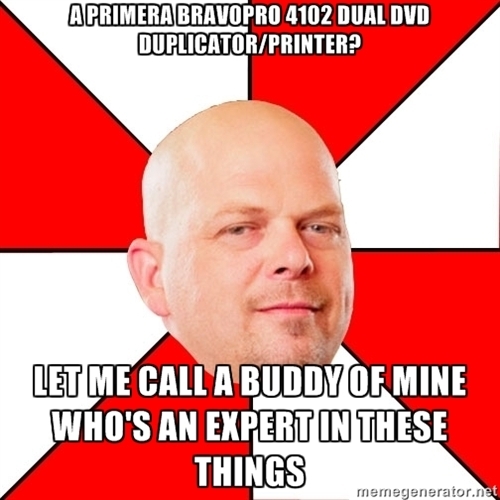 [Question] Primera BravoPro 4102 dual DVD duplicator/printer, how much used? So I have this device, "acquired" it just before it wound up being carted away at my job. Imagine my glee when I saw the thing retails for $3200 new. As I said, it's used, but from what I can tell it works perfectly. Assuming I want to sell it, what do you guys think a good fair price would be? I'm not entirely sure I want to sell it, as it is very cool, but I do need the money & this is a pretty pricey toy. I may also consider trade for a decent 3D TV. I wish I had some printable cds floating around to play with this thing. It can duplicate from a source disc, an iso, a video_ts folder on your HDD, etc. Pretty cool. Does up to 100 discs at a time, and my understanding is it's pretty fast. Maybe I should go into the disc duplication business? That might be a decent side business, don't you already do some DJ work? A lot of people that pay to have their weddings and other special events videoed don't want to pay the videographer the full rate for duplicate copies. I saw it on Amazon for $2500 bucks new. If you click on the "Have one to sell? Sell on Amazon" button on the right, you can create a new listing for a USED one with all the info in just a couple of clicks. Start at $2200 and drop it a $100 every few days until you sell it. I bet you get $1800 at least for it. I did that with a couple of old DVD/VCR combo units I had and they went for about 75% of what the cost of a new one was.